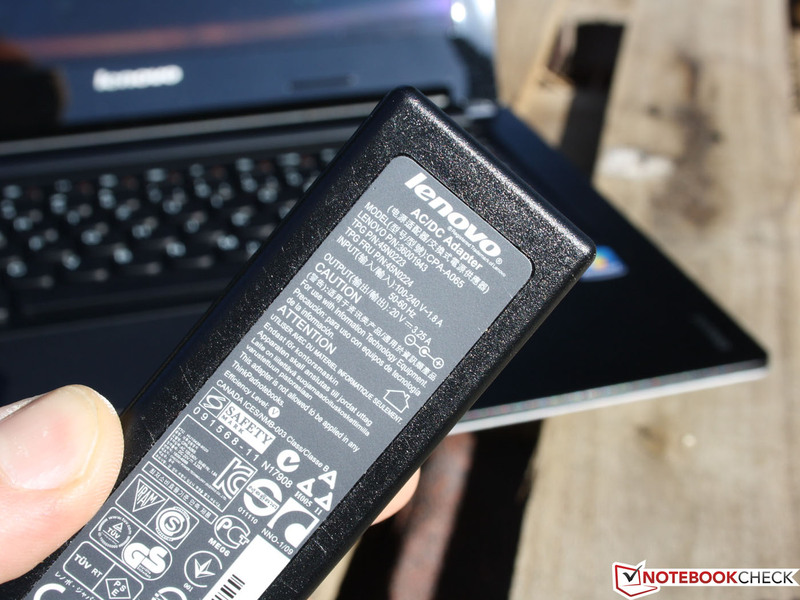 Lenovo IdeaPad S300 (MA145GE): mobile subnotebook for gaming? Looking for a slim, handy subnotebook with a decent GPU? 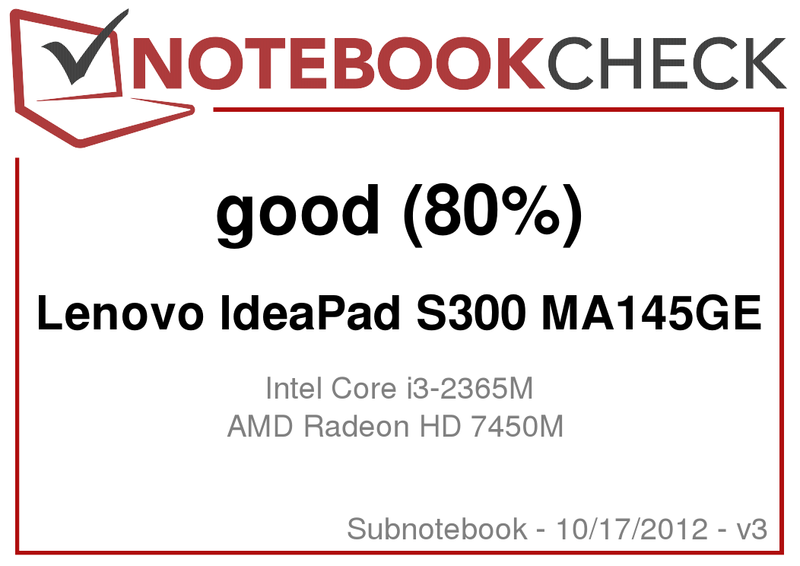 While most Ultrabook manufacturers choose to sacrifice graphics performance in order to achieve better run times, emissions and dimensions, Lenovo have chosen a different path in the 13.3-inch IdeaPad S300. 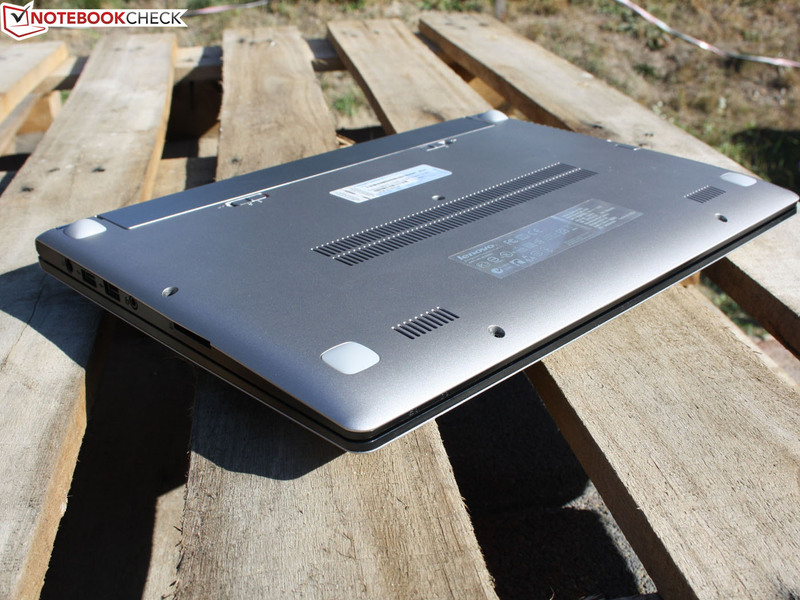 As a result of the low price, the model is equipped with a Core i3-2365M (17 W CPU - Low Voltage) instead of a Core i5-3317U, which most Ultrabooks favor. It is also equipped with an AMD Radeon HD 7450M, which enables it to offer more graphics performance (AMD Enduro graphics switching - the AMD GPU and the Intel HD 3000). The laptop seems like the perfect package and is available for 549 Euros (~$710). Let us take a quick look at the competition: the flat, 13-inch HP Envy 6-1000sg Ultrabook (740 Euros/~$957 - i5-3317U and AMD Radeon HD 7670M) and the 15.6-inch Acer Aspire V5-571G (starting at 470 Euros/~$608 - GeForce GT 620M). For the price of our test model, the Aspire V5-571G can throw in a Core i3-2367M and for another 100 Euros (~$129) the buyer can get an i5-3317U. 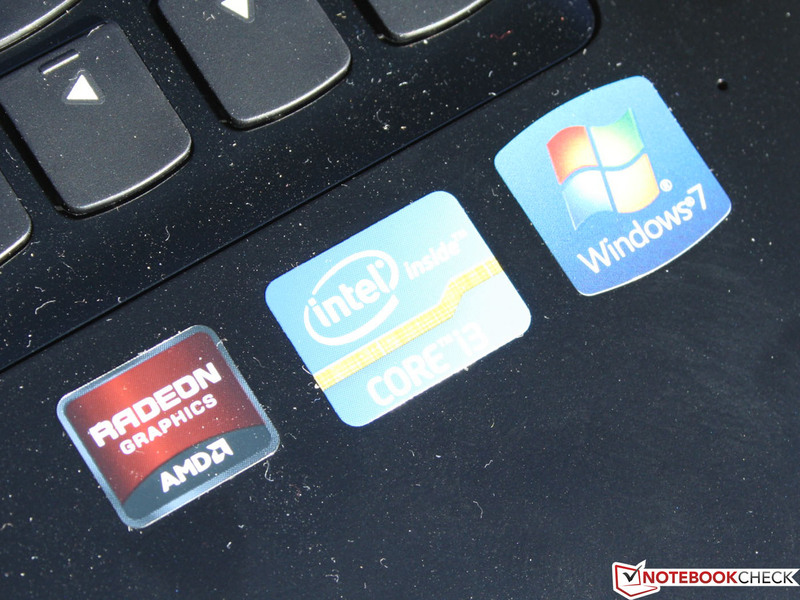 In short: want a slim 13-inch laptop with an Intel CPU and decent gaming performance? We present the Lenovo S300. The question remains whether this model will only bring joy to gamers, or if it offers some standard subnotebook features as well? Find out it in the following review. ... provides directions for dismantling. Our test model sports a silver-gray case. Alternatives are available, but they do not include the Radeon GPU: a pink and a red version can be found in the Lenovo shop. The manufacturer deceives buyers a little about the dimensions of the laptop: if we include the feet, the model is 26 mm (1.02 inches) thick (at the back). 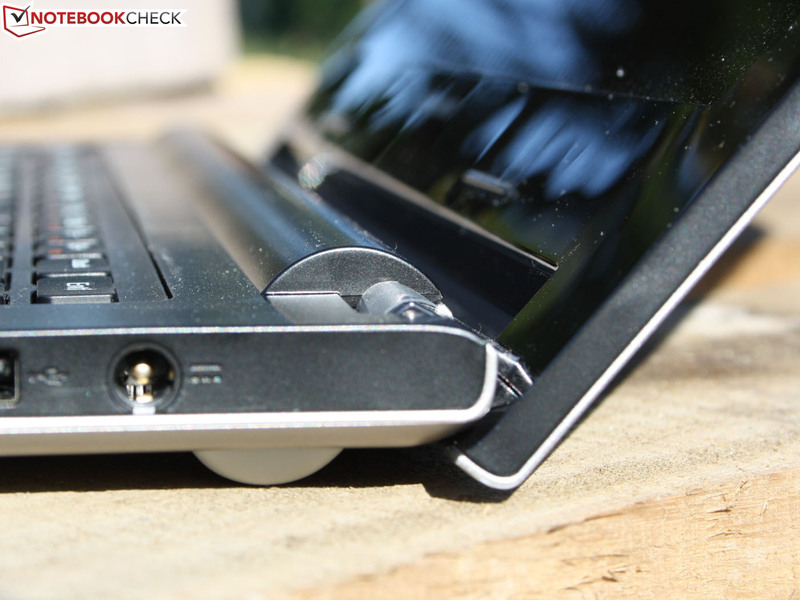 The laptop has a ventilation opening placed on the bottom, and, although the feet add about 5 mm (0.2 inches) to the laptop, thanks to them, the laptop's cooling system has enough breathing room. The laptop has poor sturdiness. The base of the laptop is very weak: it can be pushed down to the table with medium force. The hinges are another weak point: although they hold the panel stiffly, they let it wobble considerably. In addition, when the laptop is opened up to its maximum opening angle, they bend the case slightly. Finally, the lower third of the display cover is susceptible to pressure. The material gaps and surfaces are clean, but they could have been better if a magnesium or aluminum alloy had been used for the case. The display cover and the bottom of the laptop are covered with a silver lacquer. 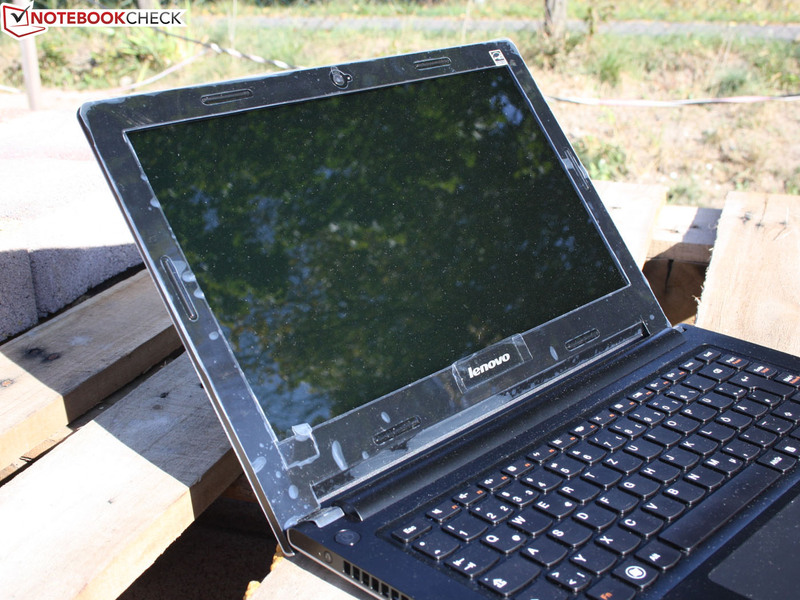 This can be a problem, as, after this laptop has been used a while, wear marks will start to appear, due to rubbing and scratches. This would not happen if the manufacturer had stuck to a plain plastic surface. The bottom has no flaps. 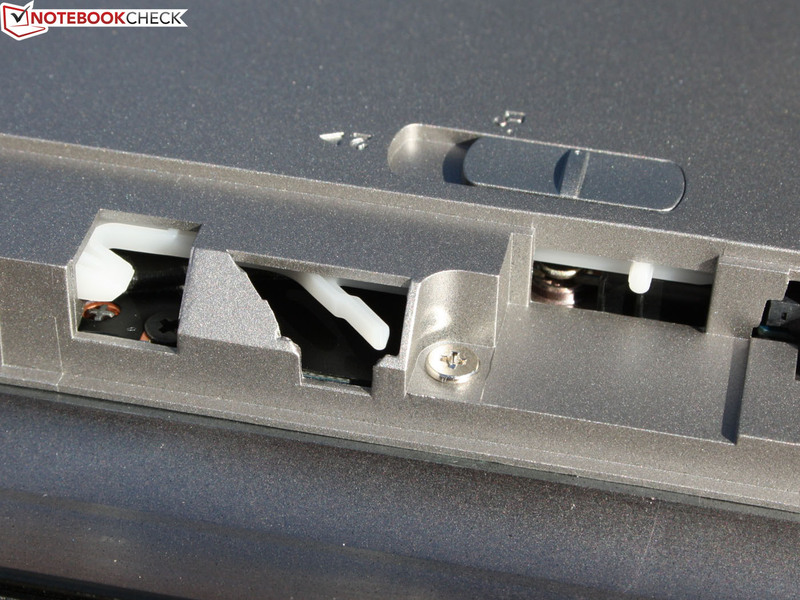 The dismantling procedure for this model is similar to that of the S400 - all screws have to be removed (even the ones under the feet) to remove the bottom of the laptop. The hardware manual details the procedure and informs the user how to swap out the HDD (under the keyboard), the RAM (1 slot) and the PCI Express Mini card (WLAN/Bluetooth). The manual will even instruct the user on how to take apart the cooling system and keyboard. This will allow the user to clean out their cooling system and keep it performing at 100%. 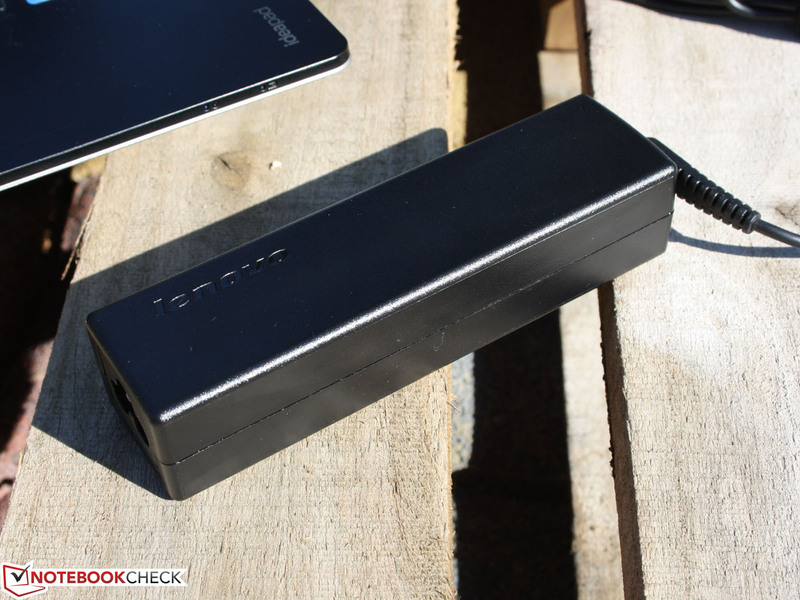 The connectivity may be limited, but Lenovo has included a USB 3.0 interface and an Ethernet port. The Ethernet port has been designed very well and will hold on to any RJ-45 cable securely. 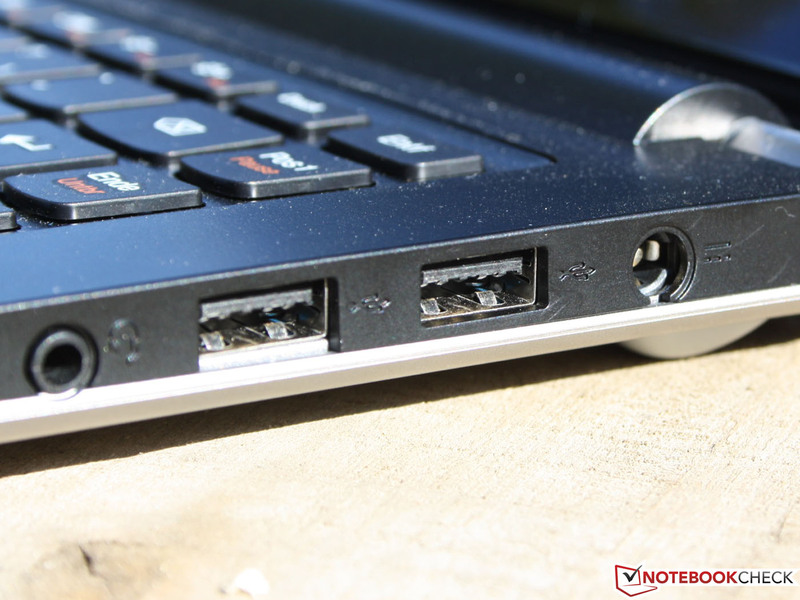 Although an Ethernet port is very useful, it is not included in every Lenovo model: take, for example, the sleek IdeaPad S206. On the other hand, our test model only has a digital HDMI output and no analog VGA interface. The S300 can transfer files over a network thanks to its support of the latest WLAN standard, Draft-N (Atheros AR9285) and Fast Ethernet. It may seem surprising, as almost every 08/15 model offers gigabit Ethernet, but Lenovo has stuck with the outdated Fast Ethernet standard. Yes, most users do not have a LAN cable running around the house, and as such, it may not seem important what Ethernet standard is supported. However, any user who has tried to transfer a few hundred gigabytes of data from their PC to their laptop will wholeheartedly agree: nothing is simpler than using a LAN cable and gigabit Ethernet. Transferring data via a WLAN router usually results in unnecessary hassle. The WLAN module, Atheros AR9285, includes a Bluetooth chip (AR3011 Version 3.0). The integrated webcam has a resolution of 640x480 pixels - outdated. It remains a mystery why Lenovo did not pick a 720p HD webcam (1,280x720 pixels). The highest resolution offered by the pre-installed Lenovo You Cam is the mentioned VGA resolution. The picture quality is not good in poorly lit surroundings, but it is sufficient for pixilated video chats. Snapshots are not very useful due to the poor image quality. The colors are bleak and the pictures are distorted. Our test model is delivered with Windows 7 Home Premium 64-bit. A low-cost free-DOS model is available for 449 Euros (~$581), but it does not include Radeon graphics. No DVDs are included. These can be created by using the OneKey Recovery software with the aid of an external optical drive or hard disk. The OneKey button on the left side brings up the security and backup tools. The recovery mode is started by pressing the same button while the laptop is off. Intel's Wireless Display is supposedly supported by S300. We believe it to be a fallacy as the laptop does not fulfill one requirement: it does not have an Intel wireless module on-board (see Connectivity above). We believe that this feature may be included in the non-Radeon models. ... updates social media services. Fast typing is possible on the IdeaPad S300 keyboard, but the keys lack the good stroke distance and feedback of a nice pressure point. 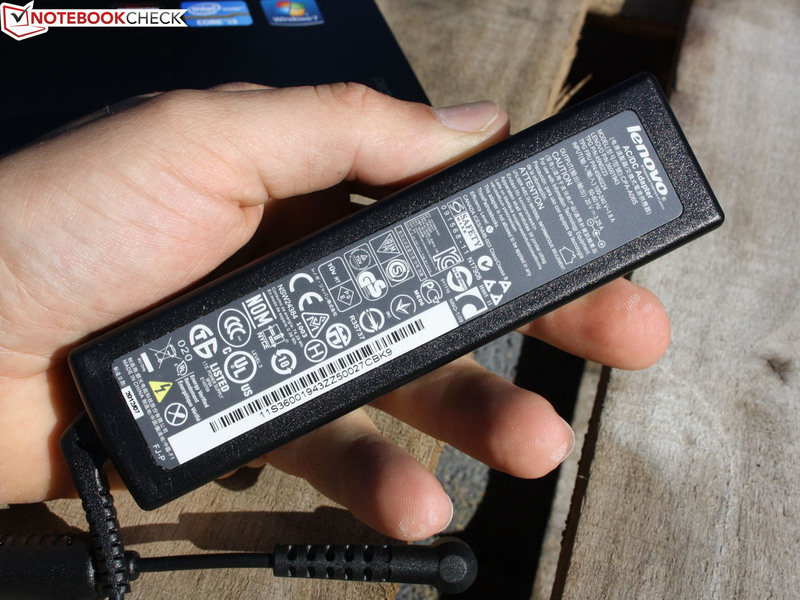 Lenovo is famous for its well-designed input devices, as can be seen from the Edge E130 and E135. The S300 seems to be the exception to the rule. The keys have medium stroke distance, but the impact is soft/spongy. The reason: the keyboard bottom gives way under force. The pressure point is decent, but the keys are not conically curved, which reduces the accuracy. Important keys, like "Shift" (right and left), have been reduced in size. The cursor keys are normal-sized. The touch-type markings can be felt clearly. The large touchpad has a diagonal of 12.6 centimeters (5 inches). This is standard for 17-inch notebooks. Thanks to appropriate friction, the finger slides quickly over the surface and wet fingers do not cause any problems. 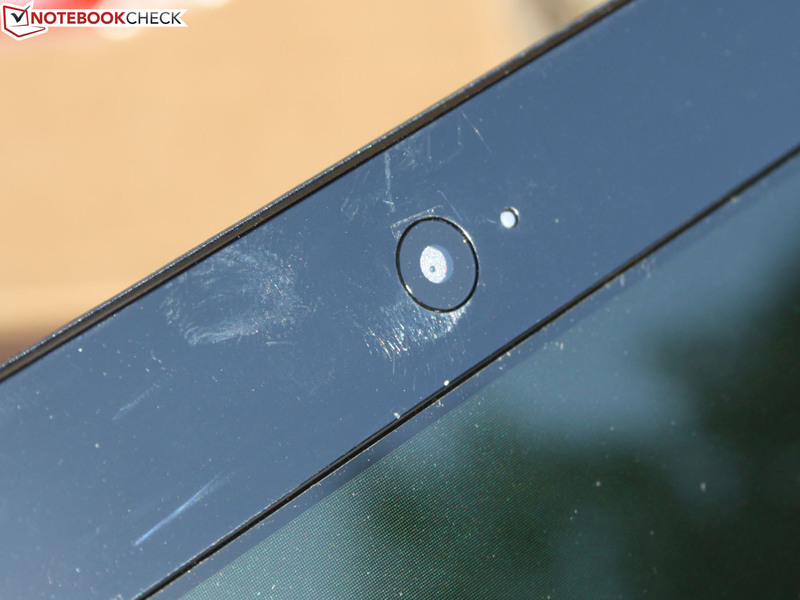 The touchpad surface is slightly depressed. 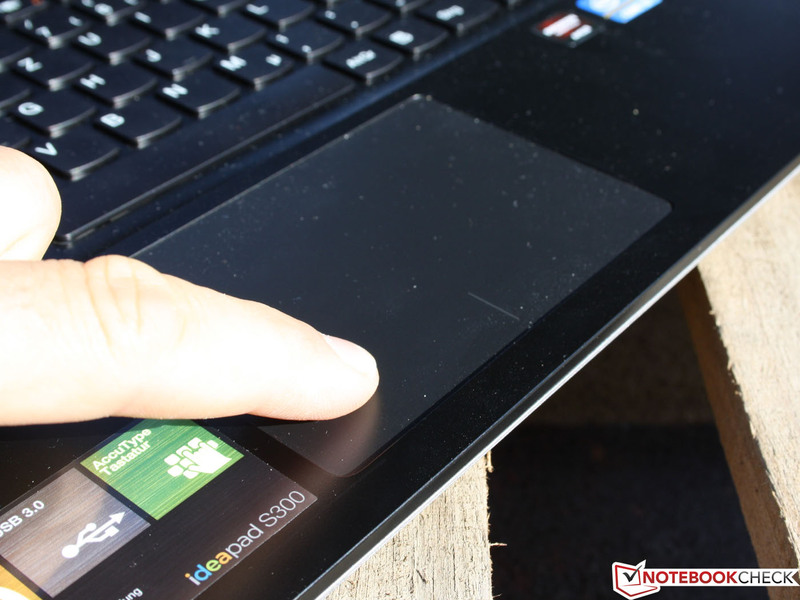 Multi-touch gestures are quickly recognized by the Synaptics ClickPad V1.1. Of course, traditionalists can continue to use a single finger. The vertical and horizontal scroll bars can be configured. The mouse keys are at the front, below the touchpad. A click in the middle will execute a left-click. Sadly, the stroke distance is short and becomes even shorter as the finger moves upwards, away from the middle of the touchpad. In the upper quarter of the touchpad, the user cannot execute a click. As such, the feedback is weak and forced. The pressure point is clear and the user is notified by a loud, muffled noise. Lenovo uses an HD panel with a native resolution of 1,366x768 pixels. The 16:9 display (LG Display LP133WH2-TLE1) is glossy. Although, the contrast is low at 168:1, the glossy-type panel compensates for it a little. The S300 has appropriately pale colors for its price class and alternatives are available starting at 1,000 Euros (~$1,294) (Asus UX31A). High quality panels usually have very good color spectrum coverage. We are covering this section so as to cover all our bases; however, it will only interest professional graphics editors. As expected, the S300 has very poor coverage of the Adobe RGB 1998 spectrum and the same is true for the sRGB spectrum. 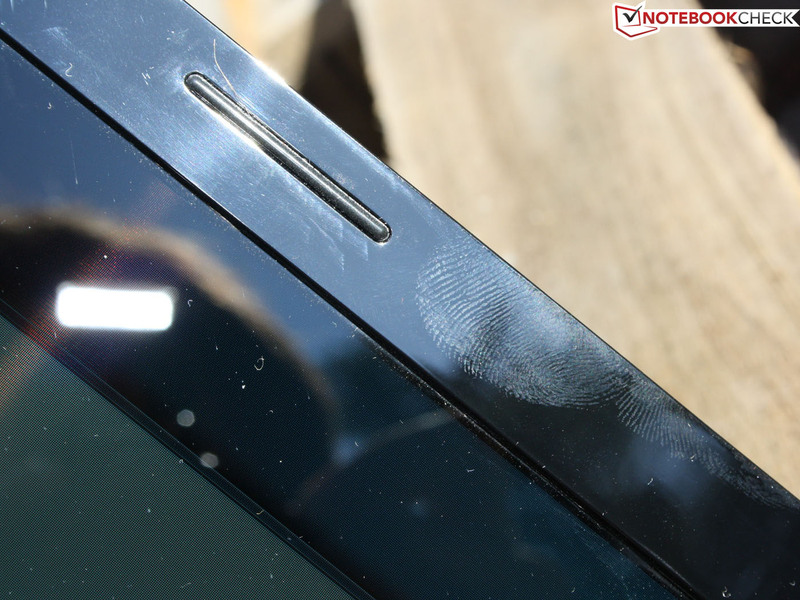 As such, the comparison with the high-end panel of the Asus UX31A gives a negative result. 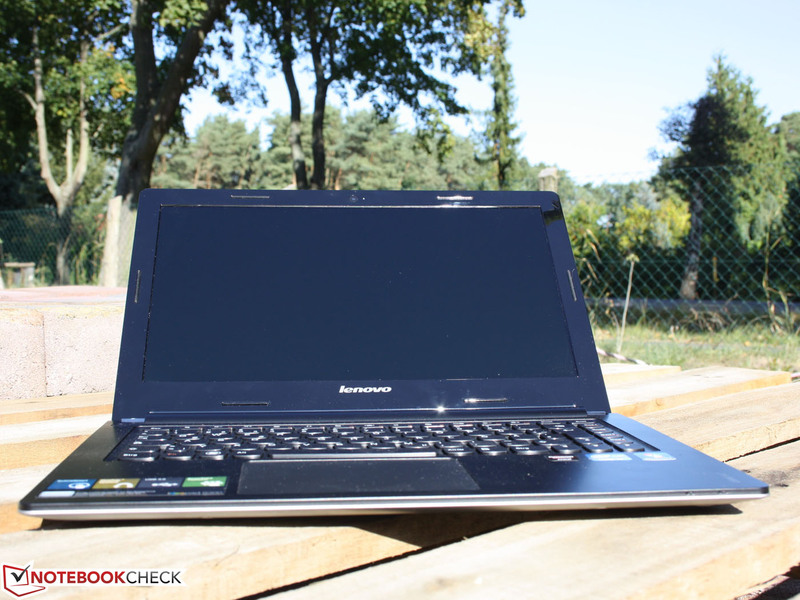 We tested the Lenovo S300 outdoors to see how well it performs in the sunlight. 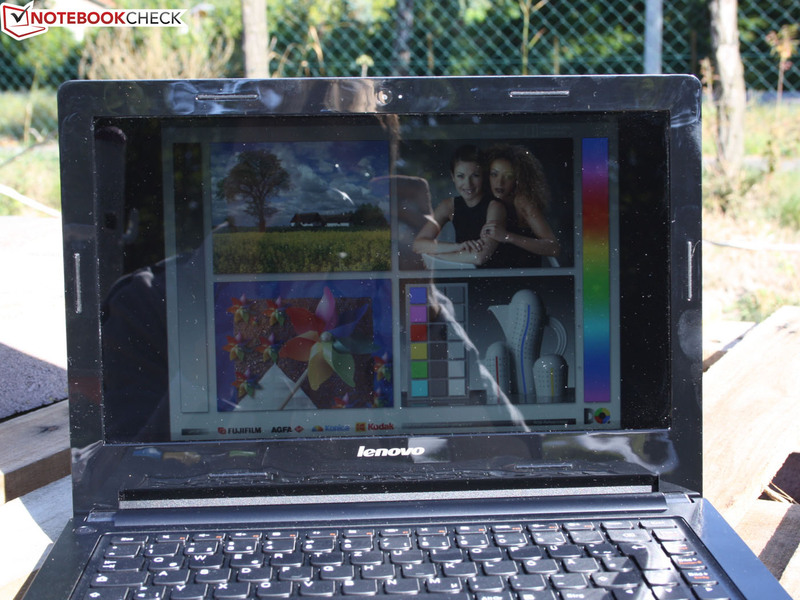 The laptop failed this test: the low brightness and strong reflections resulted in a murky, unrecognizable picture. Indoors, the brightness is sufficient as long as the table is not situated near a south window. 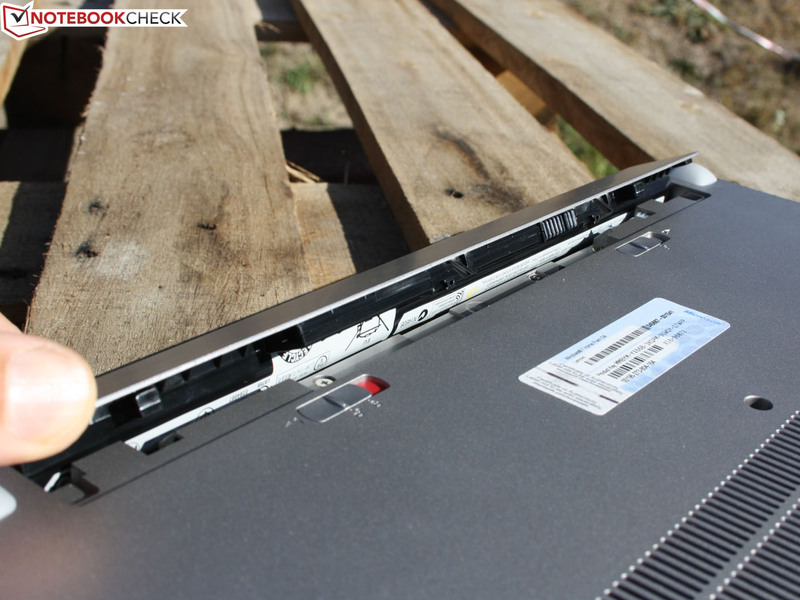 The IdeaPad S300 has poor viewing angle stability - just like 90% of 08/15 TN panels. If the eyes move up or down (vertical), ghost images appear after about 15-20 degrees. Horizontally, the eyes can deviate up to 45 degrees from the middle without the picture altering. In addition, the colors invert strongly. IPS panels have strong viewing angle stability, but these are not available in the price class of the S300. 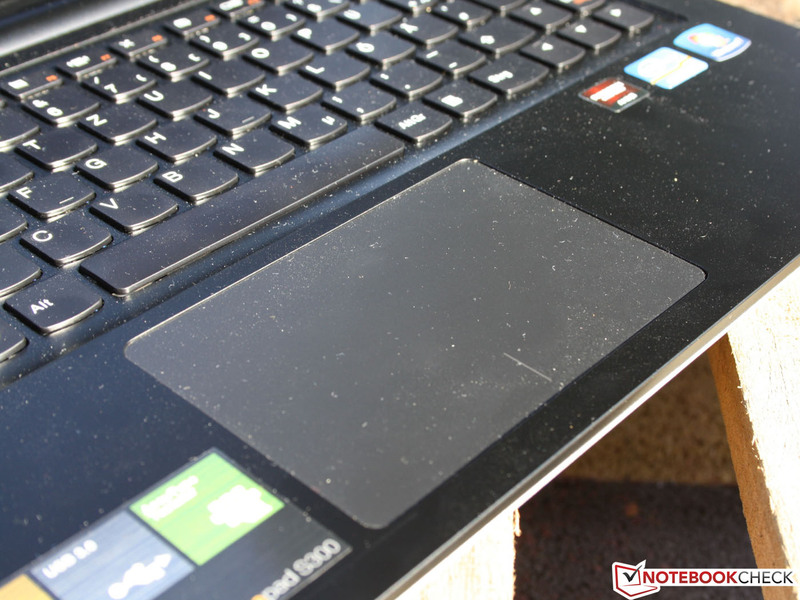 The Intel Core i3-2365M is a rarely used "Low Voltage" processor for subnotebooks and Ultrabooks. Its two cores are clocked at 1.40 GHz, but do not have Turbo Boost like the i5 alternative for the S300 (3317U). The combination with the AMD dedicated GPU, Radeon HD 7450M, is only available in the MA145GE model (our test model), which contains the i3-2365M. An i5 CPU + Radeon GPU combination is not yet available. A Seagate Momentus Thin HDD (7 mm/0.28 inches thickness) with a capacity of 500 GB is installed in our test model. The manufacturer does not offer an SSD or Hybrid for this model. The RAM amounts to 4 GB in a single slot. We suspect that the Core i3 will deliver less performance than the i5. However, thanks to the Radeon GPU, the performance will be boosted in certain applications. We will check the performance of our test model using Cinebench benchmarks. In the Cinebench R11.5 CPU Multi test (64-bit - 1.34 points), our i3 processor lags behind the i5-3317U (Aspire V5-571 & HP Envy 6) by around 78%. In contrast, against the "Low Voltage" Celeron 887 (-15%) it takes the lead. The technically identical i3-2367M (Asus UX32A) lies at the same level. The AMD A6-4455M APU (-37 %) is a little slower. We noticed similar trends in the Cinebench R10 tests. The HD 7450M is a DirectX 11 GPU which supports OpenGL 4.1, DirectCompute 11 and OpenCL. This enables the GPU to process general calculations in certain applications, like video editing, and thus relieve the CPU of some of its burden (see Cinebench OpenGL test). This means that the S300 is superior to other Core i3 systems (Asus UX32A) by up to 50%. Of course, the GT 620M or even a HD 7670M would deliver much better performance. 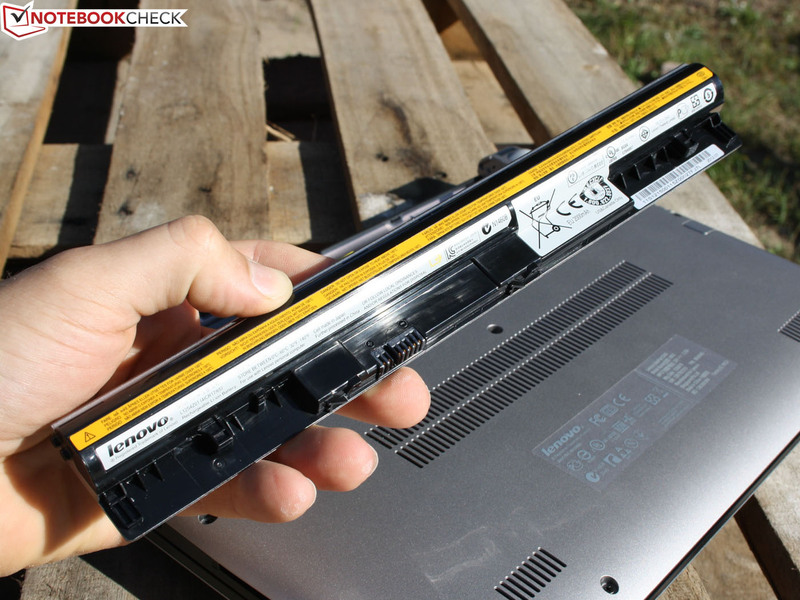 While running on its battery the laptop can not offer its entire CPU/GPU performance. The R11.5 Multi test calculated a score of 0.94 points (instead of the previously measured 1.34 points). The same behavior is noticeable in the Single-Core test (0.44 instead of 0.56) and in the OpenGL test (6.11 instead of 17.47 points). Irritating: the clock speed (1.4 GHz) and voltage (0.92 V) are the same with or without the charging cable. Sadly, we could not check to see if the Radeon GPU throttled, as all our tools only recognized the HD 3000. A 3DMark 11 benchmark run on battery mode loses more than 50% of its score (P235 instead of P613). The program performance, measured using PCMark Vantage (2008) and PCMark 7 (2011), is quite disappointing. 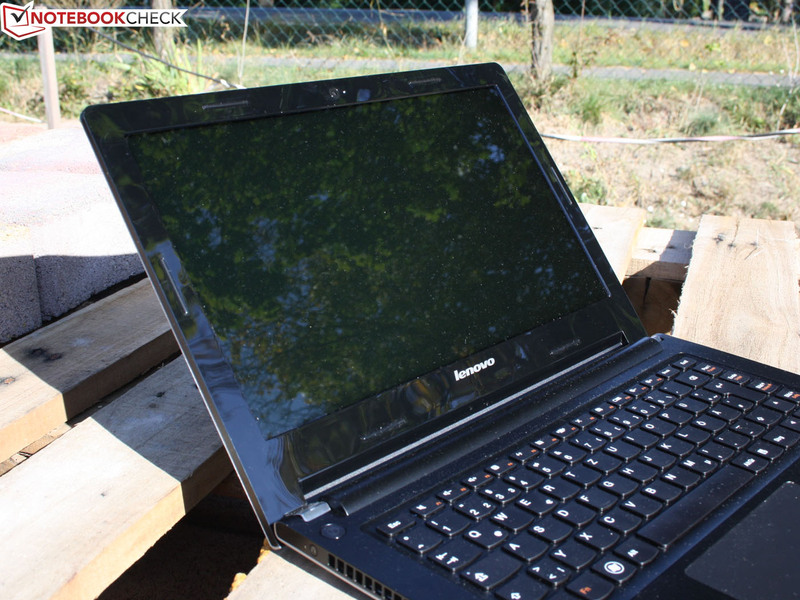 Our test model falls behind the V5-431 (running on Celeron) by 11% in PCMark 7. This model only has HD Graphics on-board. Our test model also loses against the V5-571G (GT 620M) by 42%. This gap in performance may have been caused by the higher computation score of the Celeron, as shown in some CPU tests (for example, Wprime +40 %, see the Processor section). In addition, the Computation Sub score (V5-571G; GT 620M) is around 43% better. With the exception of the HDD score, all other sub scores were good. Finally, in the PCMark Vantage benchmark, our S300 test model takes the expected lead, but only against HD graphics systems. The V5-571G is still in the lead. HDTune reads an average transfer speed of 85 MB/s. This is a good number for a 5,400 RPM hard disk. Crystal Disk Mark 3.0 always reads higher speeds, and in this case, it measures 104 MB/s. The HDD scores in PCMark Vantage and PCMark 7 do not benefit much from the average transfer speeds: the scores in these benchmarks are still far from the 4,500 mark (PCMark Vantage HDD), which a fast 5,400 RPM could achieve. The storage score of 1,505 points in PCMark 7 places our hard disk squarely in the middle of the 5,400 RPM HDD table. The reason for this low performance: distributed, small files are read very slowly by the Momentus Thin (4K Read 0.38 MB/s - Crystal Disk Mark). Quite a few of the 2.5-inch HDDs used nowadays are up to 100% faster in this test (5,400 RPM). Additional information about our drive and how it performs against others can be found in our HDD/SSD benchmark table in the FAQ. The AMD Radeon HD 7450M (1,024 MB) operates as a dedicated GPU alongside the Core i3-2365M (1.4 GHz). The HD Graphics 3000 IGP (Integrated Graphics Processor) of the Sandy Bridge CPU is used for switchable graphics. AMD's Enduro technology can automatically switch to the AMD GPU when necessary. It is not possible to manually turn on the HD 7450M permanently. The user can switch off the switchable graphics feature in the BIOS. This will lead to the Intel IGP running alone. The 3DMarks do not paint a good picture of the HD 7450M. In the classic 3DMark 2006, the GT 620M (+92%) of the V5-571G is clearly faster. The Radeon HD 7670M (+94%) is just as fast. Although the CPU dependence is left out of the 3DMark 11 benchmark, the alternative GPUs still have a great lead (+87 and +91%). Gamers who want to play on a subnotebook should ask themselves: rather a GeForce GT 620M (Aspire V5-471G/571G) or an AMD Radeon HD 7450M (test model)? The HD 7500G (IGP) in the AMD Trinity-based 13.3-inch Samsung 535U3C might also be an interesting candidate. Or would you rather save up till you can get a HD 7670M, like in the HP Envy 6 Ultrabook? The games in the table paint a clear picture: the GT 620M is the best for gaming. This GPU is twice as fast as the HD 7450M in the S300. The strong i5-3317U of the V5-571 probably contributes greatly to this high performance, but even the cheaper Core i3 Aspire V5-471G (GT 620M) seems to offer better performance than our test model. The HD 7670M (HP Envy 6) also places behind the GeForce GPU. So putting down more money for HP's Ultrabook does not translate into more gaming power. We also noticed in the Aspire V5-171, that a HD 4000 IGP (i5-3317U) could achieve the gaming performance delivered by our S300 test model. In short: the gaming performance of the Radeon HD 7450M in the S300 is quite disappointing. The Radeon GPU is only slightly ahead of the HD 4000 IGP. 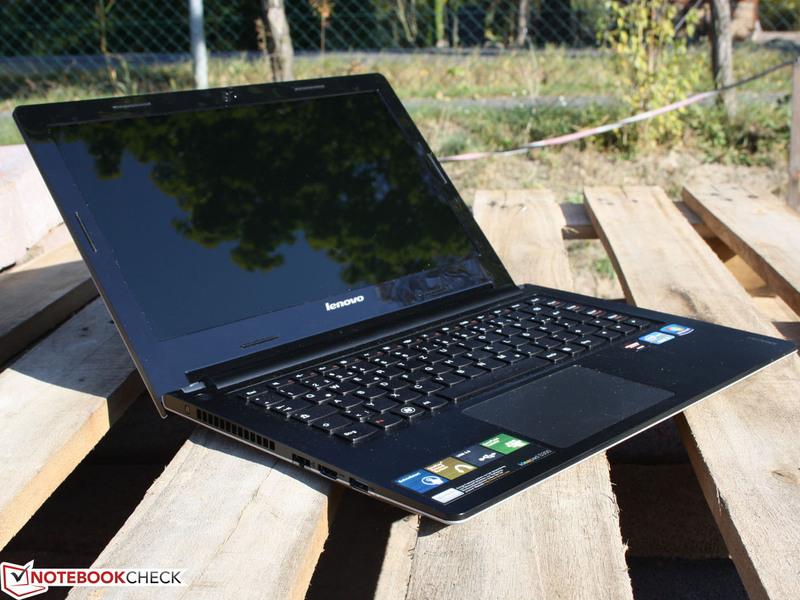 As such, the Lenovo S300 is not the best gaming laptop out there. We are excited about the Aspire V5-471G test model, as that 14-inch model should be quite similar to the S300. The 13.3-inch model is a comfortable companion at low load and while idle. The fan rarely shuts off completely. While it operates at a lower speed, we measure 32-33 dB(A), which is barely audible. The hard disk is even quieter than the fan at its lowest speed (30.4 dB(A)). At high load, the emissions change. We put the IdeaPad S300 in a rather unrealistic situation in this test: Prime 95 (CPU) and FurMark (HD 5470M) ran for 2 hours simultaneously. The noise emissions rose up to 41 dB(A). The emissions would remain at 39 dB(A) if the user were running 3DMark2006 or a game. This constant noise emission is bearable. The competitor, V5-571G (GT 620M), had similar emissions to our test model, but due to the high pitch of its fan, we had to take away some points. While idle, the IdeaPad S300 remains cool in the keyboard and hand-rest regions. 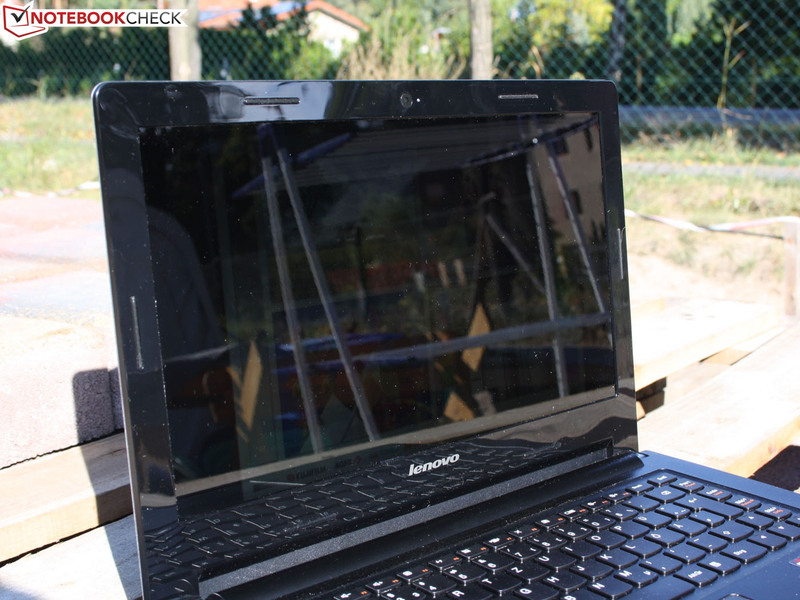 The top and bottom of the laptop have similar temperatures: both regions are around 30 degrees Celsius (86 °F). The temperature emissions rise by a few degrees in office use at low load. 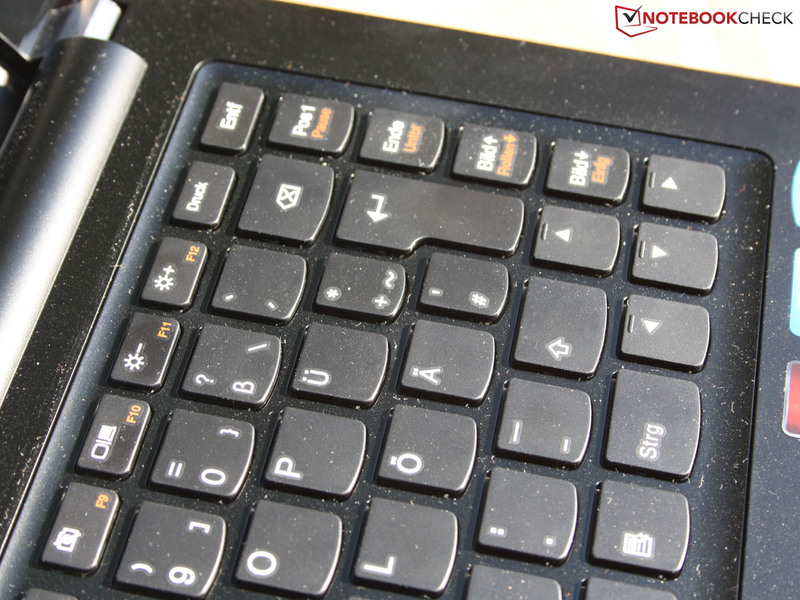 The use of the notebook on the lap should not be a problem, even in high load situations, as long as the ventilation opening on the bottom of the laptop is not blocked by cloth. At load, the temperatures rise significantly (up to 50 degrees (122 °F) here and there), especially at hot spots, which can be found above and near the middle of the keyboard. This stress test simulates a worst-case scenario and as such the user will probably never encounter such high temperatures. The stress test ran for multiple hours on the CPU and HD 7450M GPU, but the S300 kept its cool. HWinfo records a constant clock speed of 1.4 GHz (CPU). The CPU temperature shown by HWinfo reaches a max of 80 degrees (170 °F), but we caution the reader that this value may be slightly inaccurate. Dolby Equalizer with presets and many individual settings. Two speakers (stereo) are placed on the bottom of the S300, near the front. They produce an output which focuses on the middles, and lacks the low and high notes. Still: the volume is decent. We can turn it up and fill a small room with the sound (for a presentation), without the sound being distorted by the small membrane. 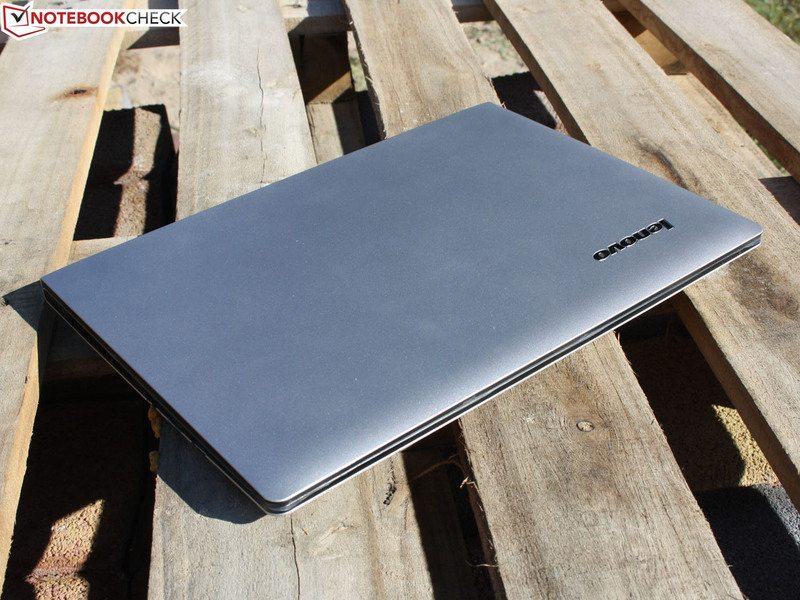 The 13-inch model is a power saver (Ultrabook standards). This is an absolute necessity as the laptop battery has a meager capacity of 32 Wh. 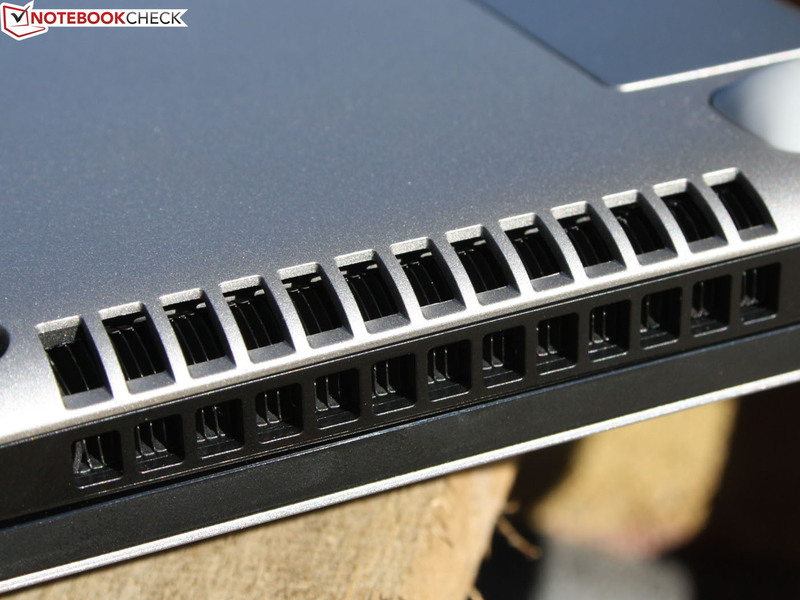 We noticed that, while idle, the low voltage i3 system requires as much power as a 13-inch Ultrabook. Core-i5-3317U systems require between 4-6 (idle min.) to 10 Watts (idle max). In our CPU+GPU stress test, the consumption rises to 40 W. The laptop requires around 26 W in the CPU stress test (Prime95 Multi). The Asus UX32A (i3-2367M) requires 41 W. Games, or other programs which cause high load for the Radeon HD 7450M, raise the power consumption to around 30 W (test with 3DMark 06). The 32 Wh capacity will not set new run time records. While idle, the 13.3-inch notebook can run around 5:07 hours. This is an unrealistic number as the laptop will rarely ever run at minimum brightness, all wireless modules off and with the CPU and GPU idle. The WLAN test is closer to the reality of everyday use: the battery is empty after 1:55 hours. On the second run, the run time dropped to 1:50 hours. The WLAN test does not cause high load on the S300. A script is run in the browser and it loads new websites and, sometimes, videos (Flash) every 40 seconds. The Radeon graphics were not active for this test. The TFT brightness was dropped to around 150 cd/m² (two levels). Other 13.3-inch subnotebooks offer more, especially when their manufacturers use batteries with high capacity: the Sony Vaio SVT1311M1ES (5:16 hours; 45 Wh), the Asus UX32A-R3001V (4:22 hours; 45 Wh), the Acer Aspire V5-431 (3:00 hours; 37 Wh), etc. 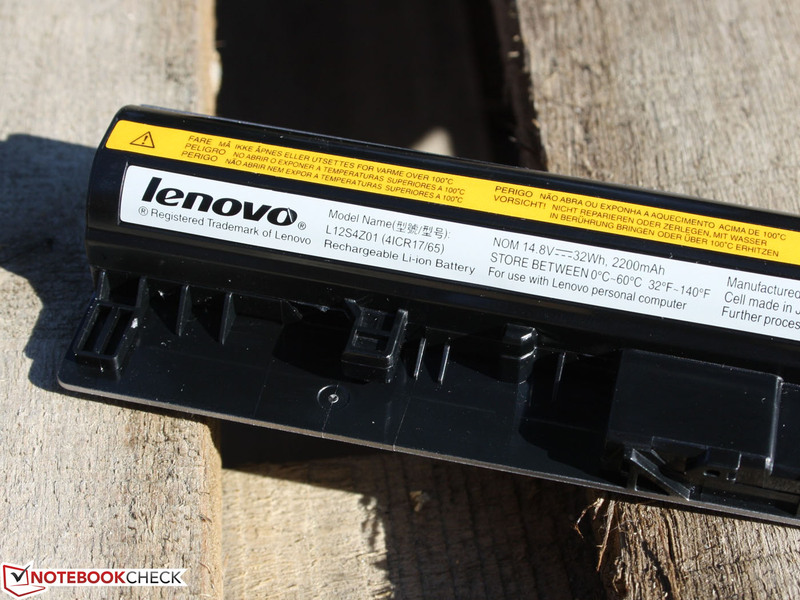 Lenovo wants to create an Ultrabook replacement. Their 13.3-inch model is cheaper (550 Euros/~$712) and offers a dedicated GPU (Radeon HD 7450M) for occasional gaming. Sadly, Lenovo bet on the wrong horse: the Radeon GPU may be better than the HD Graphics 3000 IGP of the Core i3, but it cannot match the competition, like the GeForce GT 620M, in terms of performance. The weak gaming prowess is not the only disappointment. The run time of 2 hours is too short (WLAN test). The Aspire V5 competition uses low-capacity batteries, but runs about 1:15 hours longer (15-inch). Both our test model and the 15-inch gaming laptop have poor brightness. The workmanship of our test model is riddled with flaws and weaknesses, as is the workmanship of the Acer models. The matt surfaces are nice, but the malleability of the case cannot be ignored. The keyboard of the Aspire model is better than that of the Lenovo S300. The keys are quiet on both laptops, but the spongy typing feel, caused by the weak keyboard base, puts the S300 behind. 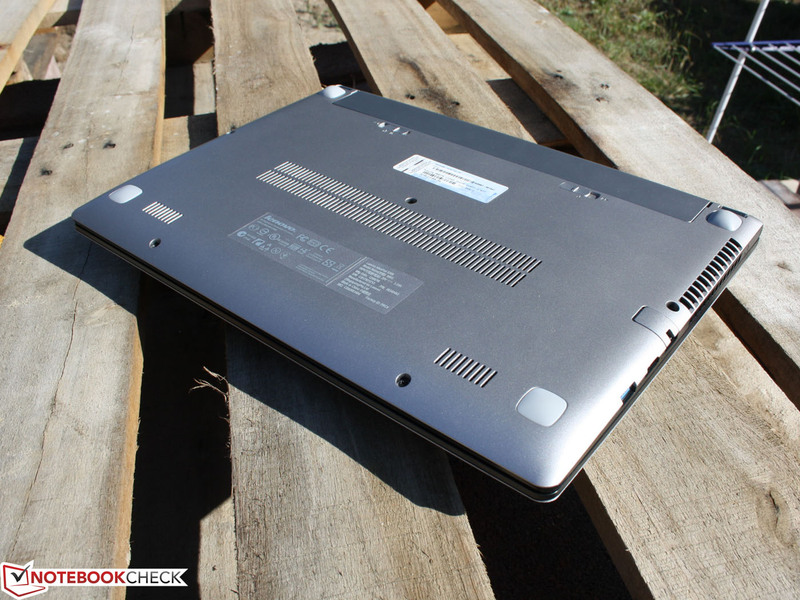 We like the low temperature and noise emissions of the IdeaPad S300. The low weight of 1,600 grams (~3.5 pounds) is also quite nice. The only other competitor in this price class would be the Acer Aspire V5-471G, which uses the GeForce GT 620M. This flat 14-inch laptop is also sold with a low-capacity battery, but the price of 499 Euros (~$646) makes this weakness bearable. We recently tested the good-looking and powerful Aspire V5-571G. The 14-inch version will follow shortly. 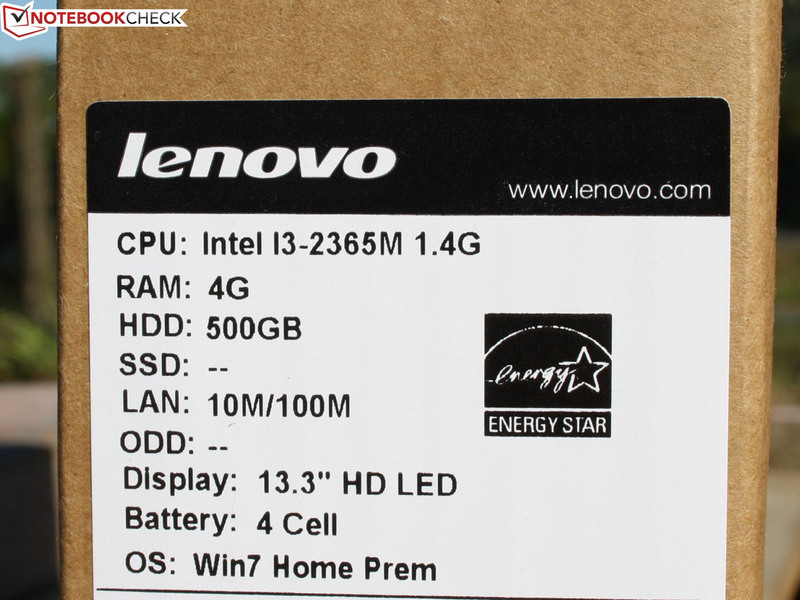 Lenovo IdeaPad S300 (MA145GE): the gaming performance of the HD 7450M is too little, to be an advantage. What is this 13.3 inch model? A low-cost Ultrabook? The flat case has relatively large feet on the bottom. These ensure better air circulation. The bottom has no maintenance flaps. An USB 3.0 interface is on-board. Lenovo has not skipped Ethernet either. The webcam captures a very poor-quality picture under poor lighting conditions. The resolution of the captured image is 640 x 480 pixels. 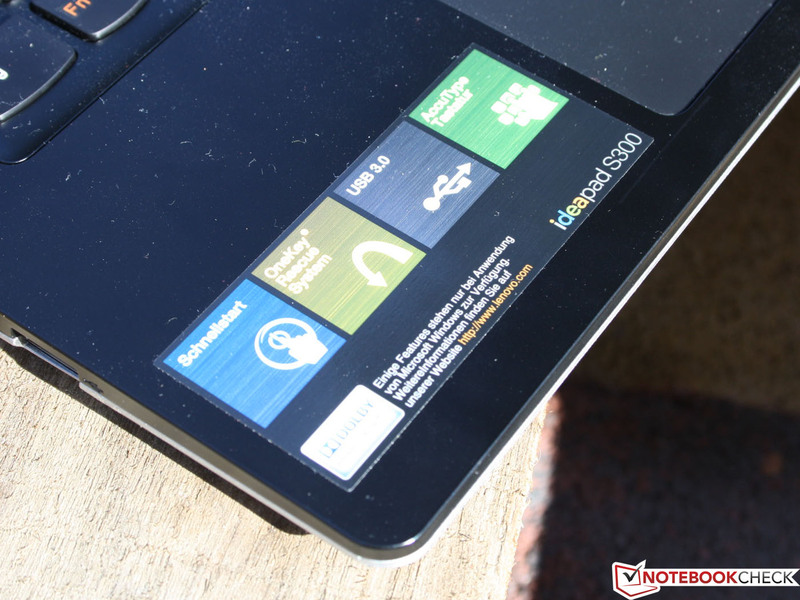 Lenovo IdeaPad S300: not an alternative to an Ultrabook. The mobilty is too limited. 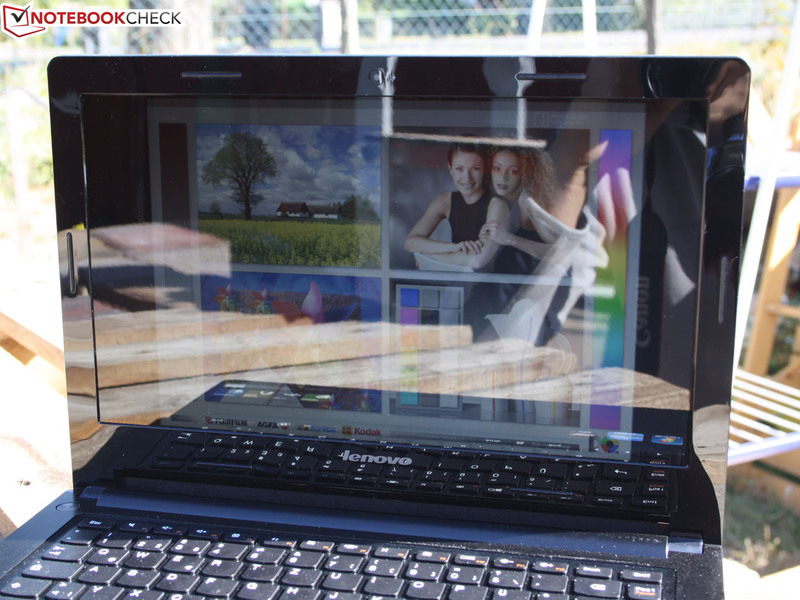 Lenovo IdeaPad S300: the glare panel can reflect quite strongly and is too dark. 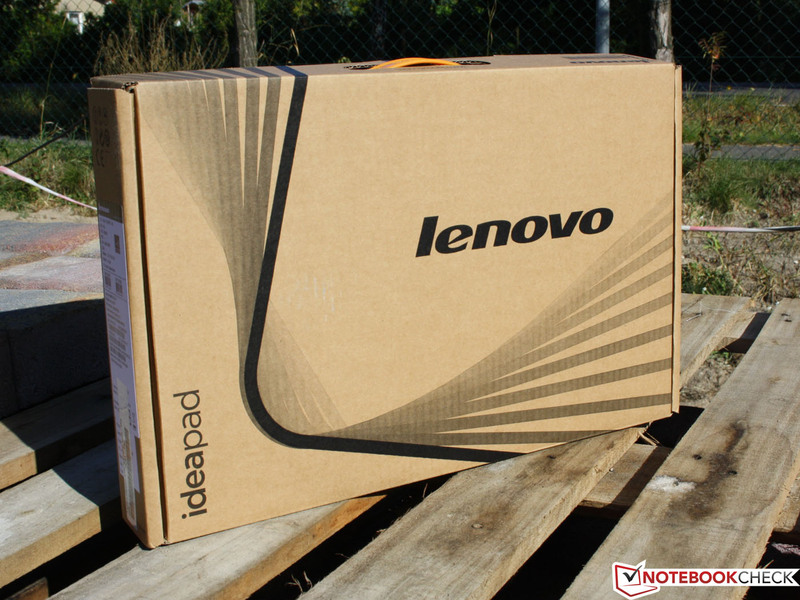 Lenovo IdeaPad S300: a model equipped with the dedicated HD 7450M. 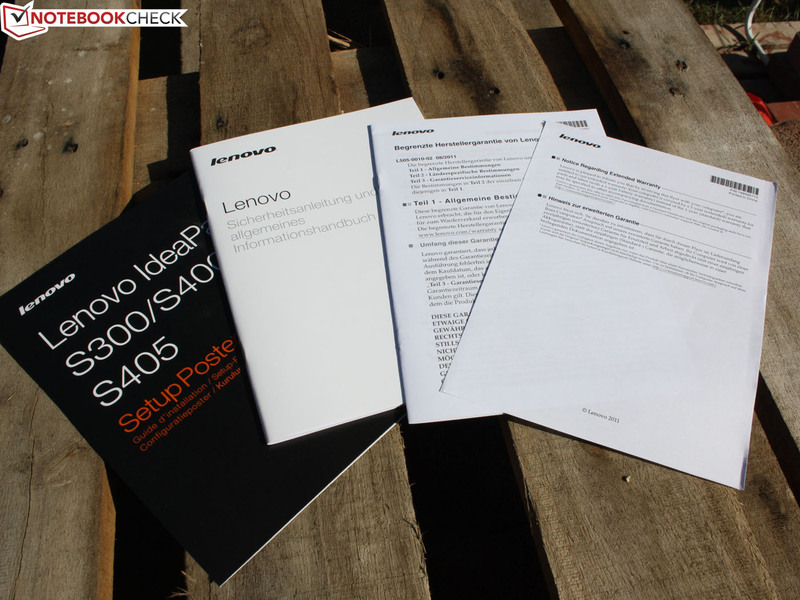 Lenovo IdeaPad S300: this is what we had for our test. Even when the laptop is off, and is not charging, it consumes 0.4 W from the socket. It delivers 65 W - more than enough to cover the max power consumption of 40 W (without charge). Or a subnotebook with the dimensions of an Ultrabook? 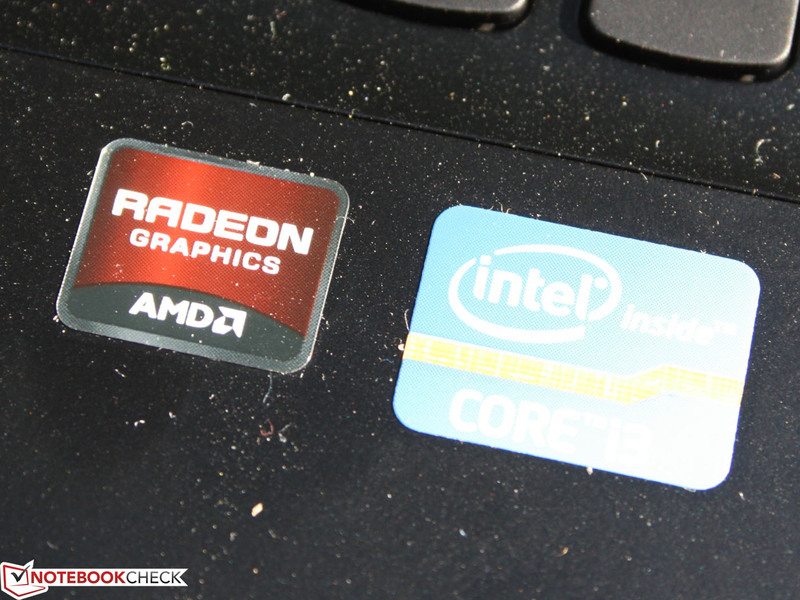 and AMD Radeon HD 7450M GPU would hint towards a subnotebook. restrict the mobility of the laptop outdoors. Despite numerous attempts, the laptop never ran more than 2 hours. 32 Wh is not an appropriate number even for low-voltage processors these days. Sure, the S300 wakes up from sleep mode in an instant. But this is not a first. A real cold system start required 70 seconds (all background programs running and the system ready). The power adapter has an unusual, long shape. 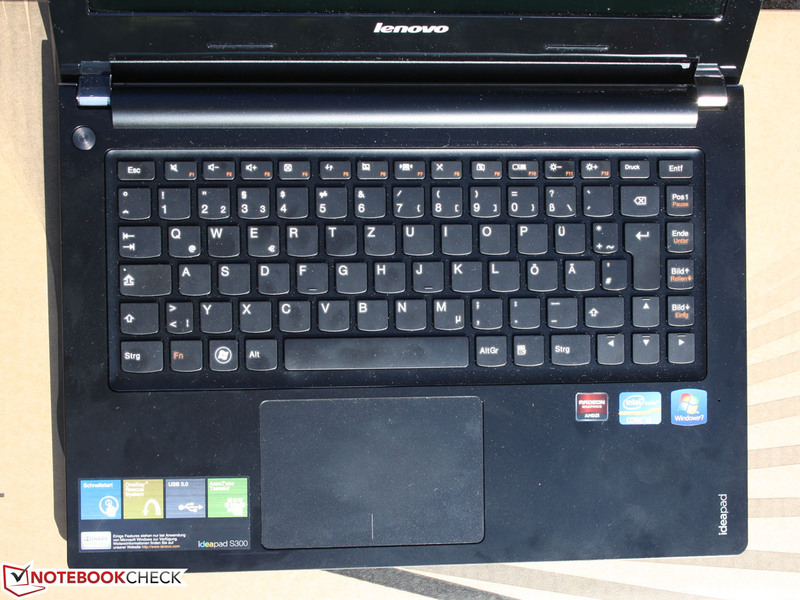 Lenovo IdeaPad S300: the keys bounce strongly and the base gives way under pressure. The concept: cheap components make it possible to compete with the high Ultrabook prices and keep thin subnotebooks affordable. As usual, programs and games need to be assigned to a GPU in the Catalyst Control Center. This is annoying. We would have not minded an additional 200 grams of weight, if that would give us a sturdy chassis. The way it is, the case does not feel sturdy and reliable. We do not understand why Lenovo chose not to use Optimus and an entry-level GeForce GPU. This combination would be more reliable and the performance would be better.